During the year that I spent with my grandparents on the Eastern Shore of Maryland, I was introduced to the hunter’s breakfast. My grandfather and I, wrapped in our longjohns (thermally insulated long underwear) would sit at the breakfast table in the kitchen and fortify ourselves with a pre-dawn slice of pie. He would have a cup of strong coffee with sugar and a little milk. Mine was more than half milk. The rest of the pot (prepared by my grandmother who would make it and go back to sleep) went into a thermos. We were ready to go by 5:00 am. Breakfast would wait until our return from the duck blind. It is one of my favourite ways to start a day. The well-rounded Mrs. E. also has a favourite breakfast, a specialty of Rennes, where she finished high school: les galettes de sassarin. My introduction to the savory crêpes came during our honeymoon. After having heard about them for years, I found myself sitting in a small restaurant at the water’s edge on Isle les Saintes, in the B.V.I. 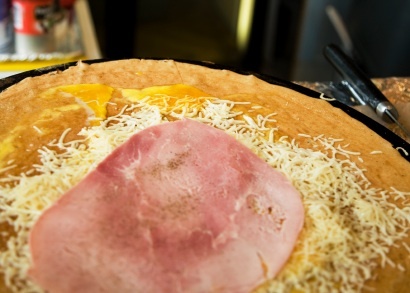 A Breton couple retired to the island and decided that they just couldn’t live correctly without galettes. I could see why. The good news is that with today’s new emphasis on things organic, finding organic buckwheat flour was as simple as heading for my local supermarket. So this morning I treated Mrs. E. to a bit of Brittany with une galette de sarrasin completes. Put the sea salt and flour into a medium mixing bowl. Make a well in the middle and pour in your beaten egg and water, mixing them into the flour. Your batter should be runny and a little “ropey” when you lift your whisk. Preheat your large skillet over high heat and brush it with a little clarified butter, and/or spray with the butter spray. Pour enough batter to thinly coat the bottom of the skillet (a 1/3 of a cup?) and quickly rotate and tilt the skillet to coat the bottom with the batter. It may have holes in the middle. Fine. When the edges go crispy, flip the galette over and finish the other side. That will take very little time. The middle may be a bit spongy and the edges crisp. Perfect. Remove to a platter and keep warm under a towel or in a very low heat oven. This being a regular morning, we skipped the cidre brut in favour of a cup of coffee and bit of orange juice. Don’t feel you have to. This entry was posted in Entertaining and tagged recipes. Bookmark the permalink. I never was a breakfast person until my college semester overseas. It’s now my favorite meal of the day. I most certainly will add the buckwheat flour to my market list & give this a go over the coming weekend. That is, if I can wait that long. Sounds wonderful! Hmm, I smell something worth waking up for! Nothing finer than waking up at the crack of dawn for a home-made b’fast! My fave breakfast is a good cuppa milky coffee and some french bread with good butter. That sounds delicious. However, I’ve heard of much fortification taking place in the blind. Just to keep the chill away mind you, of course. And lets not talk about the conversation. Its a fine way to start the day. Hey, was that a duck I heard??? ?